Folks interested in seeing what Gigabit Internet service looks like can visit Wicked Fiber's first public gigabit demo site - Z's Devine Espresso at 23rd & Harper. Z's has been a customer for a while, but today got upgraded to Wicked's Gigabit Fiber service. Be sure to get a taste of Z's excellent coffee while you are drinking a flood of data from their Gigabit hotspot. To get the Full Monty you'll need an 802.11ac enabled device. This will enable you to get full use of the bandwidth at the site. Simply connect to "Wicked Fiber Hotspot" and you'll be good to go. 802.11b/g/n devices can still connect, but they need to use the legacy "Z's Hotspot" SSID. 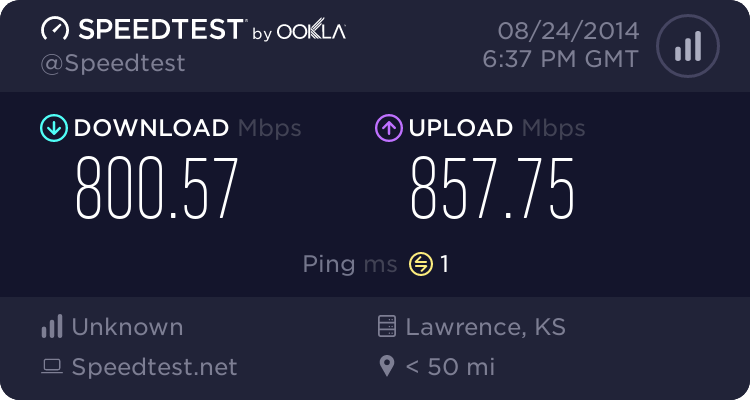 If you are interested in getting these types of speeds to your home, please be sure to come and voice your opinion at City Hall on September 9 at 6:30 PM. The time is finally here. On September 9, 2014 at 6:30 PM the Wicked Fiber ultra high speed broadband project we've been working on for the past 16 months is up for a final vote at City Commission. I'm writing today to let you know that despite approval from the City's Public Incentives Review Committee, passage of the necessary regulatory changes and financial support by our City Commission is uncertain. As one of our pre-registered Wicked Fiber members, your attendance will be instrumental in securing the support of the City of Lawrence. If you can make the meeting, we'd love to have you there. Your opinion matters. Our City Commission needs to hear how important Internet infrastructure is to the future of our community, they need to see that the community wants 21st century Internet infrastructure. Please join us Sept 9 at 6:30 PM to make your views known. You may have missed it, but a couple months ago, Chanute announced it would spend $13 Million in public funds to build a fiber-to-the home network. Looks like parts of it are already up and running. 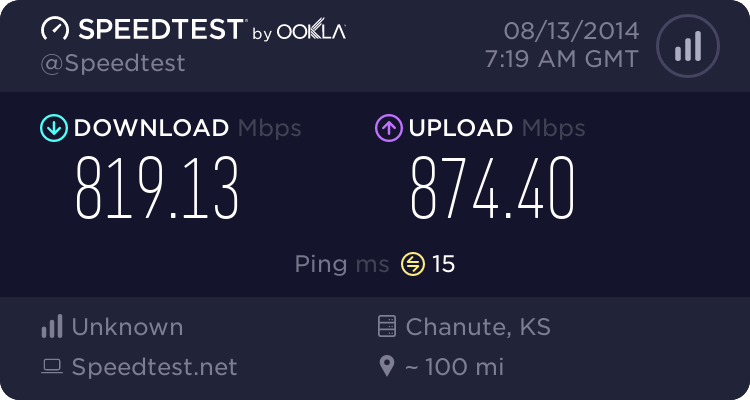 The speedtest below is between our newest sorority customer, Alpha Chi Omega and Chanute Kansas. 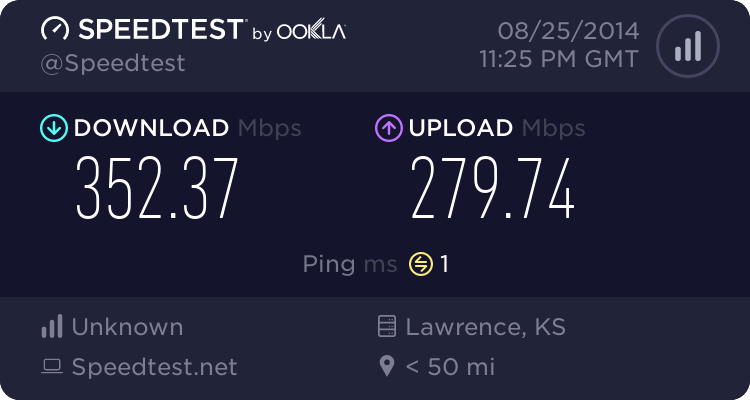 Right now Lawrence is 27th in the state for Internet speeds, despite hosting one of the fastest ISPs in the United States. Simply put this is because Wicked cannot access the capital it needs to expand this service to every resident. We are too small for Wall Street to have interest and FDIC won't let Main St. banks lend with a network as collateral. If you want this kind of service at your home, please come out and support us at City Hall on Sept 9 at 6:30 PM. All we are asking for is a loan guarantee - a mechanism that allows us to use the Bank's money on advantageous terms to build a network for our entire community to use. You may not know, but in addition to providing free Internet service for Headquarters Counseling Center - a suicide prevention organization, Wicked Broadband donates $200/Month to Headquarters to help facilitate their mission. With the tragic death of Robin Williams yesterday in the news, we would like to encourage our members to donate to this important cause. My military unit has seen two suicides in the past year and due to funding cuts at the City of Lawrence and State of Kansas, many social service organizations are struggling to obtain the resources they need to fulfill their mission. First off I'd like to point out that folks on our fiber network have experienced no problems at all. They have been seeing hundreds of megabits per second of service and have been entirely uninterrupted. If you want gigabit fiber to your home (and vastly more reliable service at a price similar to what you are paying now), please don't hesitate to come out and support us at City Hall on Sept 9 @ 6:30 PM. We've been putting in a lot of hours the past two days and are now within striking distance of getting our network squared away. We ended up losing 2 tower sectors to lightning, one at 1800 Kasold and another at 11th & Mass. In addition, we had two pieces of equipment damaged in a way that caused them to flood our network with traffic. This is what has been causing flaky service near 23rd & Kasold, 19th & Mass and 23rd & Haskel. We had substantial damage to our equipment at Poehler Lofts as well, but have just about squared that site away as well. We are now down to chasing street level sites. We are hoping to have all of these up and running by late this evening. We are planing on starting on single family homes some time tomorrow. Lionell will be contacting folks and working out dates and times. The current lightning storm is has damaged a number of sites around Lawrence, with heavy damage NE of 23rd & Kasold. We will be reporting at dawn tomorrow (0630) and aim to have the network back to nominal by sundown. Thank you for your patience as God punishes the Wicked.